It’s not often that pine plantations offer a glorious display of local wildflowers, so what’s going on? Recently, Olwyn & Ben Brook took a small group of locals to see an amazing sight. An area of pines had been harvested about two years ago and the new trees were doing well. But the plantation manager, checking on the area, was stunned to find an unexpected array of colour amongst the lush green of the Pinus radiata. Strangely, this melting pot appears to be a unique phenomenon, not previously seen in the many thousands of hectares of pine plantations in the Strathbogies. Clearly, something has promoted the growth and flourishing of the native species here, but the show is restricted to about 20 m either side of the track and only on this one ridge-line. With so many peas in the mix, fire is clearly implicated, but fire is common in the plantation after harvesting, yet these natives are only growing in this one spot. As our group walked around we were all pretty stunned! It’s rare enough to see such a display in the local bush, let alone in this rather alien landscape, but still, it was spectacular. This mystery deserves further investigation! Previous Previous post: Sunny weather stimulates reptile activity. 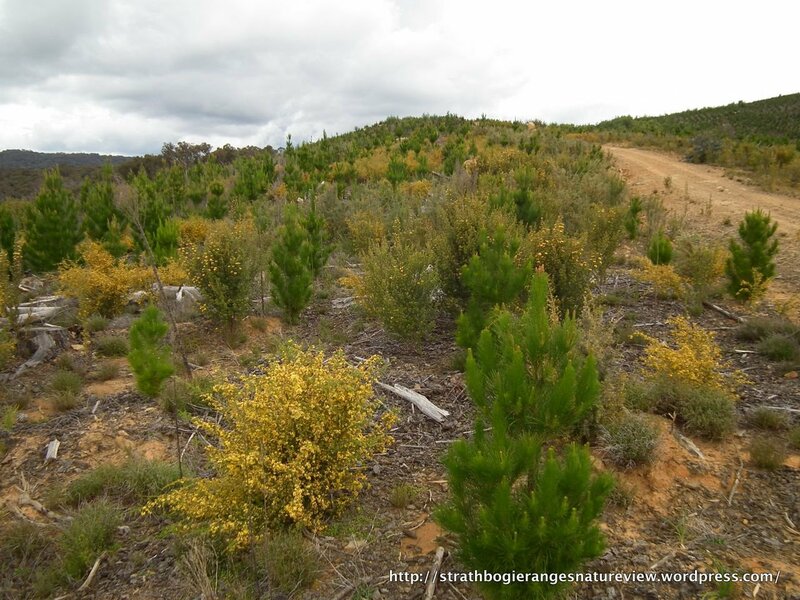 Next Next post: Warrenbayne Heathy Dry Forest – A Marvel.